With Demna Gvasalia at the helm, Balenciaga retains its unique and innovative approach to fashion. Fusing understated luxury with athletic and urban inspired silhouettes, you’ll find Balenciaga Kids filled with mini versions of pieces from the main lines. Expect bold colours and confident style that is complimented by a unisex appeal. You’ll find all you need for style conscious children. Red logo tracksuit hoodie from Balenciaga Kids featuring a hood, long sleeves and a kangaroo pocket. 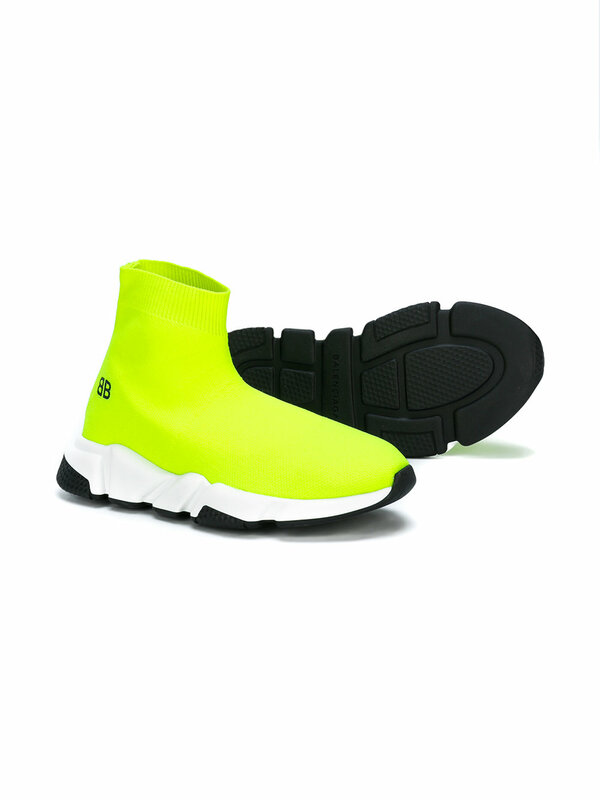 Yellow Speed sock sneakers from Balenciaga Kids featuring a slip-on style, a round toe, a BB logo to the side and a two-tone textured rubber sole. This item is unisex and is made in Italy. Light grey cotton logo embroidered T-shirt from Balenciaga Kids featuring a round neck, short sleeves, a straight hem and an embroidered logo to the rear. Black Think Big T-shirt from Balenciaga Kids featuring a round neck and short sleeves. 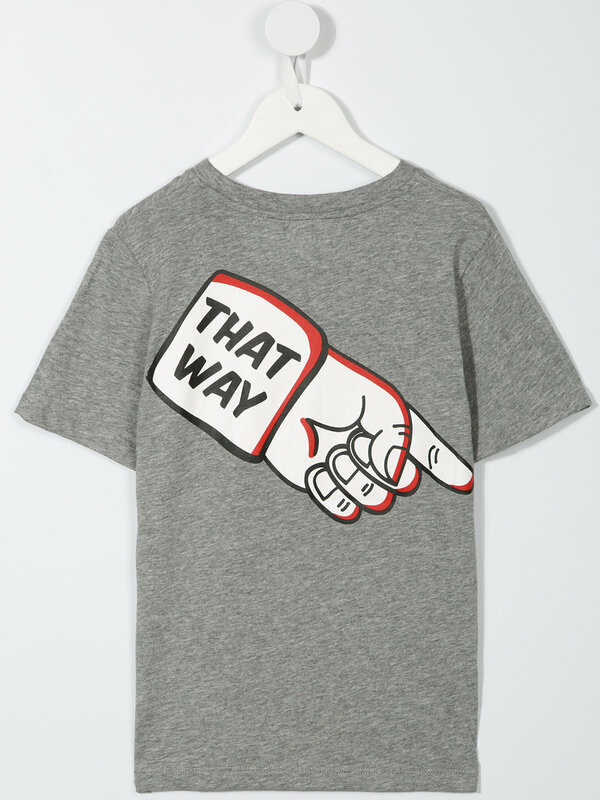 Fun, modern and playful, Stella McCartney Kids offers a line of easy-to-wear styles for boys and girls. Committed to sustainability and animal-free fashion, the collection follows in the footsteps of the pioneering mainline. Expect illustrated prints and popping rainbow hues that capture the spirit and energy of youth. 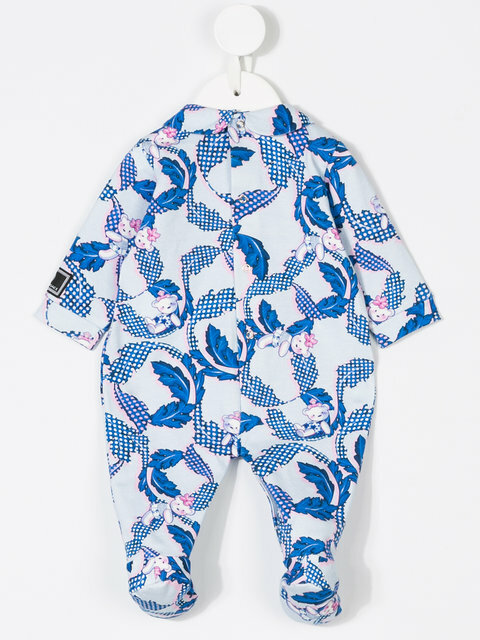 Enjoy laidback cool looks in sustainable high quality fabrics Stella McCartney Kids is renowned for. 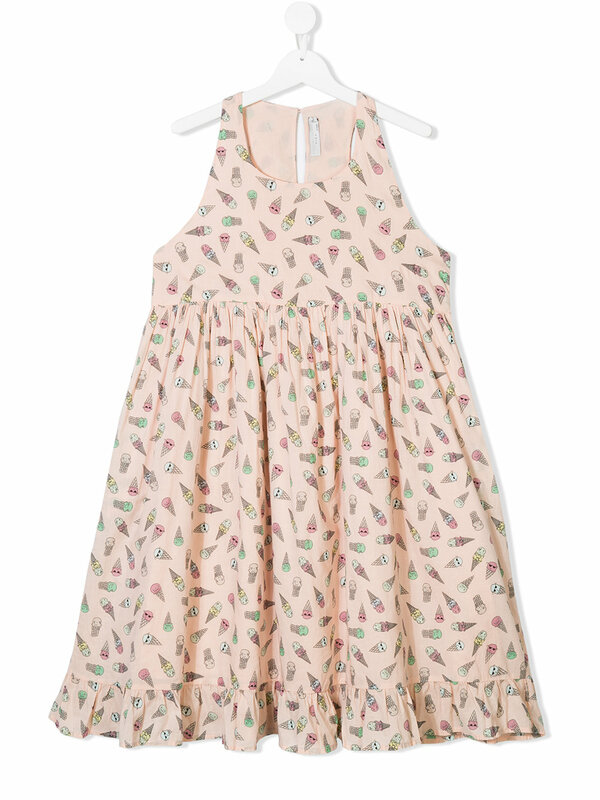 This light pink cotton printed dress from Stella McCartney Kids features a round neck, a sleeveless design, an all-over print, a pleated skirt and a back button fastening. Crafted from medium grey pure cotton, the Arrow Mutant T-shirt is presented with prints to the front and back. This piece features a crew neck, short sleeves, a straight hem, a print to the front, a print to the rear and an internal logo stamp. Blue and white cotton striped romper from Stella McCartney Kids featuring a round neck, short sleeves, a back button fastening, horizontal stripes, a print to the front and a regular length. 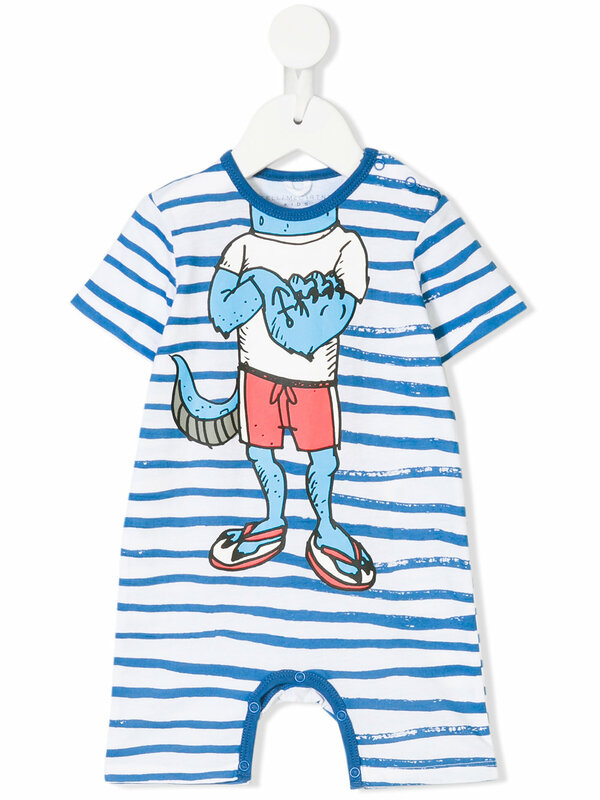 Laidback cool looks in sustainable high quality fabrics Stella McCartney Kids is renowned for. 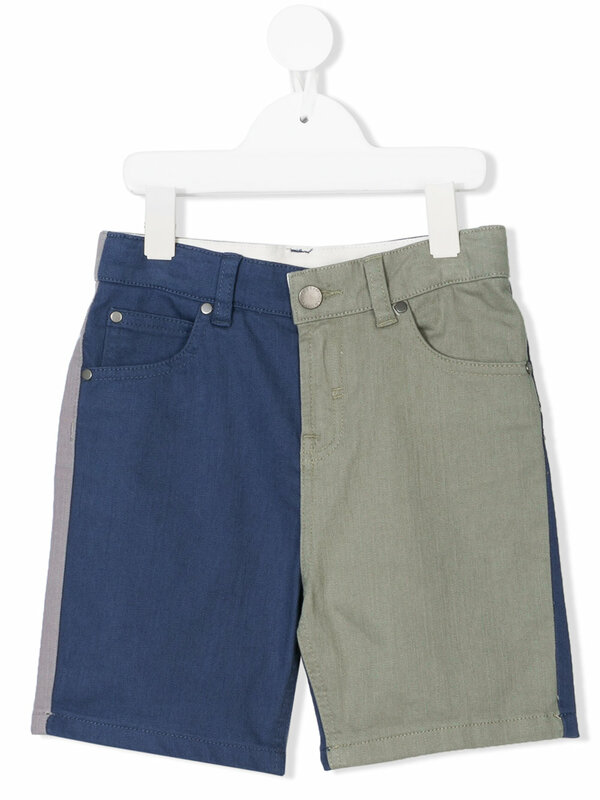 These multicolored cotton blend color block denim shorts from Stella McCartney Kids feature a front button fastening, a waistband with belt loops, a five pocket design and a color blocked design. Reimagining pieces from the standout adult line, Young Versace is unmistakable for its flamboyant designs and striking signature prints. From the iconic Medusa motif to the Baroque patterns, this is kidswear that packs a stylish sartorial punch. Liven up your child’s collection now with a unique, vibrant pick from this luxe Italian label. 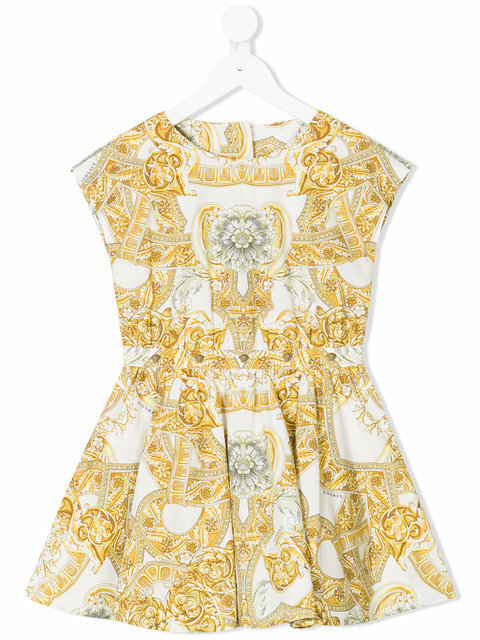 White and gold-tone cotton baroque-print dress from YOUNG VERSACE. Blue cotton blend Medusa print dungarees from YOUNG VERSACE featuring adjustable shoulder straps, a side button fastening, side pockets, a short length and a Medusa print. Pink leather floral embellished sandals from Young Versace featuring an ankle strap, an open toe, a branded insole, a flat sole and a signature gold-tone Medusa head at the front. Tonal blue cotton blend teddy print pyjamas from YOUNG VERSACE featuring a classic collar, an all-over print, long sleeves and a press stud fastening.